Valentine’s Day is special, and you want to show how much you care by gifting them something they’ll truly love. You’ve made many magical memories on your outdoor adventures, which gives you inspiration for your Valentine’s present. Luckily you’ve found this guide, which will give you the 12 most special presents for someone who loves camping. Click here to skip to gifts for him. This backpack has been an iconic bag since 1978 (the same year we started roasting!). The chequered design of this modern take on the classic bag is a breath of fresh air. It’s moisture repelling fabric combines functionality with design, which creates the must have backpack for any outdoor adventure. Gift your Valentine with a practical present that they will love to show off on your next camping trip. Bug bites are something we all struggle with when camping. It can turn a fun adventure into a nightmarish weekend full of mosquitoes. Anti-bug repellent does do the trick, but is your partner worried about the chemicals it may contain? Or put off by the strong unnatural smell? Extracts of cinnamon, Patchouli and Cedarwood create a wonderful smell to this moisturiser which is loved by many of the reviewers. It’s also Deet-free, so no need to worry about harmful chemicals. 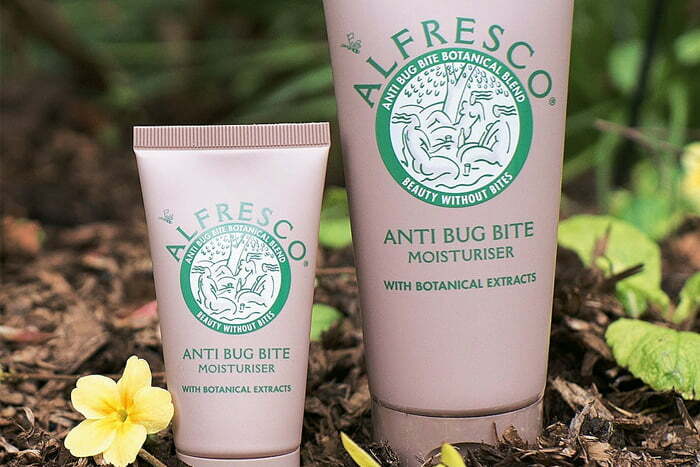 Bring a touch of luxury to your camping adventures by gifting your partner this delightful and practical moisturiser. Cosy, warm and perfect for the outdoors. Made from 100% wool, this knitted hat is the perfect accessory to gift your partner this Valentine’s Day. Topped with a fluffy faux fur pom pom, it’s a sweet present that they’ll greatly appreciate next time your adventuring in the cold. By buying from the National Trust, you’ll also be supporting the conservation of beautiful sites, historically significant locations and the UK’s cultural heritage. This personalised clock features a classic vintage motorhome silhouette and pine trees. It is designed by one of Zazzle’s artists that has created a lovely gift for any camping fan. Make it extra special by personalising the names, the background colour, text colour, font and much more. It’s a lovely gift to display in your home that will remind you of all the wonderful memories you’ve made together when camping. This officially licensed VW canvas holdall is the ideal bag for those who like to bring a touch of style to their outdoor excursions. Lined with wipe clean material, fitted with heavy duty handles and featuring a YKK zip, it is the ultimate camping bag that combines design and practicality. Choose from red, blue or brown when purchasing for your Valentine. There’s nothing more relaxing than indulging in a good book on a warm Summer’s evening sat outside your tent. The sun starts to set, creating a beautiful landscape, but what about your book? You don’t want to ruin the atmosphere with an overly bright night light, so you’re running out of options. A clothes peg clip light is the ideal solution as it securely fastens onto your book whilst providing the optimal amount of light for reading. It’s such a wonderful present, you might even have to get one for yourself. Add a peaceful, warm, atmospheric glow to your music experience whilst camping. Or, make your speaker the centre of attention when blasting your disco tunes on a warm summers evening. However you choose to use the Outwell Obsidian speaker, we can guarantee it will bring a new lease of life to your listening experience. The charcoal grey speaker, slim design and leather handle makes this a stylish gift that your partner will be proud to display on his next camping trip. Gift your partner something thoughtful and cut his complaining on your next camping trip. Once you take the HotRox on one camping trip, you’ll wonder how you ever went without it. We all enjoy the initial warmth of a traditional handwarmer, but to get it back to its original state is a highly inconvenient process. This is especially true when you’re in the great outdoors. “The main features of the HotRox Electronic Handwarmers are that you have heat on demand – you can turn them on and off to suit your mood. Pop them in your coat pocket or handbag and they are there for when you feel nippy. With two heat settings, feeling cold is optional! These electronic hand warmers would be perfect to buy as a pair for you and your Valentine to enjoy on your next camping trip. “This is simply the only blanket you are ever going to need” Bear & Bear tells us. This beautifully designed blanket doesn’t just showcase style, it’s essential for any camping trip. An eco-friendly DWR finish is applied to both sides to keep you and your partner cosy and dry. It can be used as a travel pillow, sleeping bag or poncho as it comes with a detachable hood. The secret stash pocket is ideal for storing valuables such as your phone, tablet or wallet. It also includes a practical carabiner loop. This 100% recycled brushed flannel blanket is a luxurious treat that you and your partner can enjoy together on your next outdoor adventure. Would you believe this modern, industrial style bracelet contains 29 handy tools? “Perfect for the outdoorsy man or woman in your life, the Leatherman Tread comprises of 29 usable, wearable tools. Available in Stainless Steel or Black DLC. Adjustable to accommodate any wrist size and fully customisable with the links you need most, the Leatherman Tread is as stylish as it is functional. A perfect gift this Valentine’s Day. Whether your partner likes to think of himself as a pro chef or simply enjoys rustling up a hearty meal in the great outdoors, he’ll love this special camping gift set. “Specially designed for outdoor cooking, the set contains everything needed to accompany you on a camping trip or hike. The kit includes a microfibre dish towel that doubles as a wrap and a wooden chopping board, as well as a folding corkscrew knife, a folding peeler and a folding bread knife. The set contains three knives, a chopping board and a tea towel, with the knives featuring stainless-steel blades and beech wood handles. This cable knit beanie is a sweet gift that will delight your Valentine. The deep shades of ink blue and thick cable knit design make this a lovely hat that your partner will cherish. Fleece lining creates a super warm beanie that is essential for cold camping trips. This will become a regular accompaniment on your outdoor adventures and a gift that reminds him of you every time he wears it. For the coffee lover in your life, our Valentine’s Fresh Coffee collection contains special hand picked bags from our roasting experts. Pair with an Aeropress for the perfect coffee gift set.